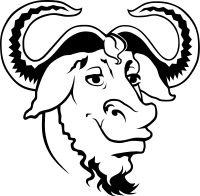 ^ Helping the GNU Project and the Free Software Movement – GNU Project – Free Software Foundation. gnu.org. Retrieved on 2013-07-17. ^ Wardrip-Fruin, Noah; and Nick Montfort. "The GNU Manifesto." The NewMediaReader. Cambridge, Massachusetts: MIT, 2003. pp.545-550. ^ Weber, S. (2004). The Success of Open Source. Cambridge: Harvard University Press. ^ Why do you call it GNU/Linux and not Linux?